2018 was a year of tremendous growth and change for the University of Utah School of Medicine (SOM). Here, I highlight just a few of the SOM faculty and staff’s many accomplishments. In March, 99 of our medical students matched into residencies at 67 programs in 25 different specialties across 32 states. We adopted a new core educator model that allows us to deeply train educational faculty, emphasizing interactive learning that adapts to students and to changes in medical knowledge and practice. The 8th annual Bench-to-Bedside competition included 60 multi-disciplinary student teams. 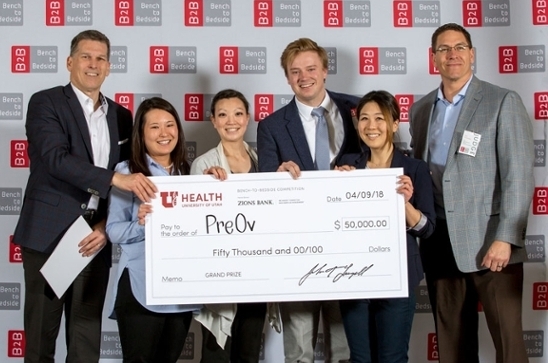 This year’s winner, PreOv, created a low-cost, real-time fertility device and was awarded $50,000 to continue product development. 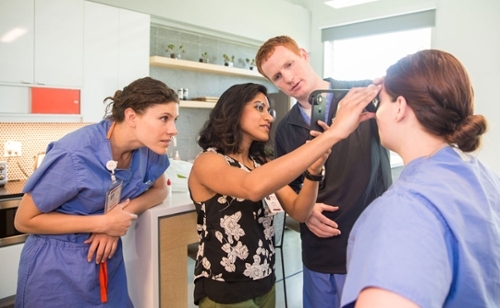 The Rural and Underserved Utah Training Experience (RUUTE) was launched to increase medical education opportunities in rural and underserved areas of Utah. Students who participate in RUUTE will be able to earn a graduate certificate in rural & underserved health. The SOM benefitted greatly in 2018 from several generous gifts for campus transformation, educational programming, and faculty development. A $15 million gift from Intermountain Healthcare for the new Medical Education and Discovery Building. The U of U Rocky Mountain Center for Occupational and Environmental Health, received an $8.43 million grant from NIOSH for training and research. A $1.25 million gift from Fred and Christine Fairclough created the first endowed chair in the Department of Neurology. K. C. Brennan, MD, is the inaugural chair holder. The Dr. Russell M. Nelson and Dantzel W. Nelson Presidential Chair in Cardiothoracic Surgery was created in honor of Nelson’s legacy as a medical pioneer and global leader. Craig H. Selzman, MD, is the inaugural chair holder. Angelo P. Giardino, MD, MPH, PhD, joined us as Chair of the Department of Pediatrics. David P. Steinberg, MD, was appointed as the new Chief of the Division of Physical Medicine and Rehabilitation and Executive Medical Director of the new Craig H. Neilsen Rehabilitation Hospital, scheduled for completion in late 2019. In 2018, SOM faculty and their research teams received more than $325 million in extramural grant awards. $145 million of that came from the NIH, representing a 24 percent increase over the previous year. As stewards of the research funds we receive from all sources, our faculty are making incredible discoveries in virtually every area of medicine and basic sciences. Overall, the SOM ranked No. 39 in NIH funding nationally (brimr.org). Department of Biochemistry ranked No. 18 in NIH funding nationally (brimr.org). Population Health Sciences received $9.3 million in funding awards, a massive leap from the $390,882 they earned in 2016. The Center for Clinical & Translational Science received a $22 million renewal grant from the NIH’s National Center for Advancing Translational Science. The Patient-Centered Outcomes Research Institute and the American Heart Association awarded faculty a $5 million grant to support development of decision aids for patients with atrial fibrillation (AFib) (collaboration with Mayo Clinic). Paul Sigala, PhD, assistant professor of biochemistry, was named a 2018 Pew Scholar for his lab’s interdisciplinary approach to developing novel methods for combatting malaria. The White House named Maureen Condic, PhD, associate professor in the Department of Neurobiology and Anatomy, to the National Science Board. Satoshi Minoshima, MD, PhD, chair of the Department of Radiology, was elected President of the Society of Nuclear Medicine and Molecular Imaging. Biochemist Dana Carroll, PhD, was one of four honorees to receive the 2018 Governor’s Medal for Science and Technology, Utah's top science & technology honor. 2018 was filled with success and growth for University of Utah School of Medicine. The future holds much for the SOM. On the strong shoulders of such exceptional faculty, staff, and students, we can safely anticipate many more such years to come! 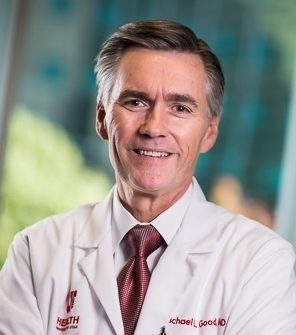 In August 2018, Michael Good became CEO of University of Utah Health Sciences, Dean of the University of Utah School of Medicine, and A. Lorris Betz Senior Vice President for Health Sciences. A professor of anesthesiology, Good joins the U after more than three decades of teaching, innovation, and leadership at the University of Florida, where he most recently served as dean of the College of Medicine for 10 years.